Last week Coach Schooley gave us the Raider Passing drill and today he offers us Canadians Reverse 1 on 1. Last night at practice I ran this drill along with a few others that are designed to work on 1 on 1 skills. This drill works on communication between the defensemen as well as defending the 1 on 1 rush. It works best with six defensemen but can work just as well with four or five also. Make sure D2 is talking to D1 and calling for the reverse. Don’t allow the D to just make the pass without the communication aspect of the drill. The D need to get used to talking to each other in practice so they can do it properly in a game. With the forwards make sure you make them use different attack options during the rush. I don’t allow my players to try the move where they put the puck between the defenders legs and try to get around them during this drill. I want the forwards to work on a power move down the wall if the D has a tight gap, or if the D has a loose gap use him as a screen and fire a shot through his legs at the goaltender. I think it’s important for a forward to have a few moves they can use so forcing them to practice specific moves during this drill will help to make them a more well rounded player. We all know that come game time they are very likely to just try and put the puck between the legs of the defender but if they practice a few other moves maybe they will attempt it during a game. Yesterday I received this simple but very effective passing drill from Derek Schooley ( @DerekSchooley Twitter handle ) head coach at Robert Morris University. Coach Schooley was the very first D I coach to offer to help with this site when I first started it three years ago so it was really great to get some unsolicited drills from him again yesterday. I took it to practice last night and used it with my team and was very pleased with how it flows. You don’t need goaltenders for this drill so my guys were working with the goalie coach while the team executed the drill. If you don’t have a goalie coach to occupy your goaltenders just have them do some crease movement drills or run it the last few minutes of practice and let the goalies go off the ice early. Make sure the players execute the drill with a high tempo and be sure to make them keep their sticks on the ice so the passes can be quick one-touch type of passes. I am always on the lookout for good team oriented drills and last night I watched former NHL player Tony Horacek run this drill with his Midget 16 team. Timing is very important with this drill and it may take a few rotations to get it right but once you do the drill will flow really nicely and force your players to make good passes and work on timing their approach to the receiving zones. This drill is best performed by the more advanced teams. I picked this one up from Ken Pauly who is a very well respected coach in Minnesota high school hockey. Every week when I look at the site statistics I see that the half ice drill section is always at or near the top for views. I know many organizations are going to more shared ice practices to save on cost and get players on the ice more often. This new dynamic is causing coaches to seek new drills to work on skills for the whole team while keeping it to half a sheet of ice. I ran this drill with my team last night and it worked nicely once we got the flow right. Make sure F1 comes up high between the D so he can better time his entry back across the blue line. 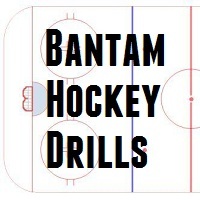 This is a drill that works on quick passing skills as well as a play that your team will use during games, posting up and chip passing to an incoming skater. Here is a simple warm-up drill you can use at the beginning of practice to get the players skating and the goalies seeing shots from all three areas of the ice. Make sure the players are skating hard. Recently my team was having some trouble consistently creating offense. We have a lot of talented players but they were getting lazy and falling back on old bad habits. Sometimes a coach needs to bring in a new voice to speak to the team about some of the concepts he is trying to teach. Chris Campanale is a local professional player who lives in our area and works out at the facility in our rink. I asked Chris if he would be interested in coming out to practice once a week and working with my team on offensive tactics. Chris was very willing to step up and help the younger players develop their offensive skills. I picked this drill up watching former NHL player Tony Horacek running a practice with his team last week. I ran it with my team last night and really liked it. The drill takes a minute for everyone to understand their role but once it gets going it really has the players working to make good passes and understanding the underneath route to making headman passes. I’ve created a quick video to explain the drill just in case the document isn’t clear enough. Here are a couple of simple but effective passing drills supplied by the coaches of Team Canada. When working on passing drills make sure your players stay focused on the fundamentals of a good pass.